An introvert according to giftedkids.com is someone who feels more excited when alone, and even less feel the spirit when in the middle of many people. Therefore if you are an introvert then there are 6 reasons why you should love yourself that is unique. An introvert has a habit of spending more time listening than talking. Well, so it makes you understand, very understanding, about the state of others. Introvert people understand what makes others annoyed, sad, angry or happy because we often listen to the details of small details when others tell stories. Being able to understand better in who is actually someone else and understand what the problem is so that it can help others is a gift for an introvert. An introvert is someone who likes to spend his time thinking. Thinking about things and how they relate to them. An introvert is very happy in analyzing, exploring about her thoughts and feelings. So when deciding a decision then your decision will really mature because most likely you've thought about it in advance. You know how and who you are. Maybe your friends will ask if you feel lonely? And you will answer clearly, not really, I prefer myself. You prefer to do things alone, but you never feel lonely. Why? Because solitude is your best space to do your activities. When most people feel depressed and slumped with solitude, you can instead express and do your activities with passion. Not that an introvert is a bad person because choosing friends. But an introvert prefers a small but qualified range of friends. Friends who are less supportive, giving less good encouragement or who do not show the quality of a good friend will be out of your friend list. 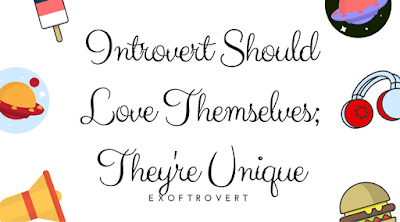 Again, introverts do not mean bad people, because actually an introvert is willing and does not mind not being considered a friend when he does not give good advice to his friend. An introvert like you no longer cares how many friends you are, but you care more about how to make close and constructive little friendships with your friends. You must be aware that this life and the people around you have their stories about sadness, injury, betrayal, heartbreak, offense, distress or anything. As an introvert, you will most likely be able to feel the emotions of others through their speech, through their eyes, or through their body gestures. Being sensitive and sensitive is a good excuse for an introvert because you will easily know the feelings of others and can quickly find the right attitude to improve the situation. Acknowledge that you spend most of your time talking to yourself or talking to yourself. Well, as said at the beginning, you are a person who likes to think, analyze, introspect and consider everything. Therefore you are very careful in speaking. You tend to talk about what matters. Anyway it's very good for you because what you talk about in addition to succinct will also qualify. Be happy to be an introvert!